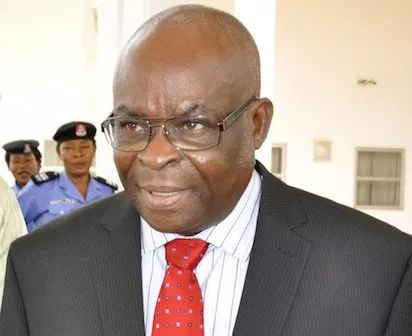 Former Chief Justice of Nigeria, CJN, Justice Walter Onnoghen, yesterday, berated the Federal Government for alleging that he confessed to the non-declaration of assets charge that resulted to his removal from office by President Muhammadu Buhari. Suspended Chief Justice of Nigeria, Justice Walter Onnoghen, Onnoghen, who voluntarily resigned his position as the CJN on April 4, maintained that contrary to Federal Government’s allegation, he did not at any time, admit that he committed any crime to warrant his trial before the Code of Conduct Tribunal, CCT, in Abuja. “This case is about alleged non-declaration of assets or failure to make a declaration. Counts two to six of the charge complained of false declarations. We submit that where a complainant alleged false declaration, it presupposes that there was a declaration”, Onnoghen’s lawyer, Mr. Okon Efut, SAN, said while adopting the defendant’s final address with respect to the charge. He urged the tribunal to dismiss the charge in its entirety, contending that FG failed to prove the elements of the crime beyond reasonable doubt as required by law. On the issue of Exhibit C which was the statement, the former CJN made before the CCB, Efut said it was grossly incorrect for the prosecution to equate forgetfulness with the admittance of crime. “This submission is grossly incorrect in law. When he said he forgot, that did not amount to a confession. He did not confess to the charge. The defendant cannot be convicted for an offence that is unknown to the law, for which there is no prescribed punishment. “The allegation here is that he failed or falsely omitted to declare assets. But our position is that there is no such offence that is known to the law in Nigeria. Until the law is well defined, an accused cannot be punished for an unknown offence. “There is evidence that the defendant substantially declared all his assets and it is not true that he did not declare his assets since 2005 until 2016. In fact, this argument even defeats their case because they said that he falsely declared. What we are saying is that the prosecution has woefully failed to prove its case,” the defence lawyer insisted. More so, Onnoghen argued that section 15 of the CCB and Tribunal Act, is in conflict with Paragraph 11 of the Fifth Schedule to the 1999 Constitution. He argued that the section upon which FG hinged the charge against him, was unconstitutional and ought to be declared null and void. Consequently, the defendant prayed the tribunal to discharge and acquit him of all the allegations against him. However, Federal Government, through its lawyer, Mr Aliyu Umar, SAN, asked the CCT to convict and impose maximum punishment on the former CJN, contending that it successfully established that he acted in breach of the code of conduct for public officers in the country. In its written address, Federal Government further urged the tribunal to hold that the prosecution proved its case against the defendant, beyond every reasonable doubt. “We urge this tribunal to rely on hard facts before it and convict the defendant accordingly,” Federal Government stated. It further reinforced its position that the ex-CJN admitted that he forgot to declare his ownership of various bank accounts that were operational as at the time he declared his assets in 2016. “Whether or not forgetfulness is an offence, is for your Lordships to determine,” FG added. Moreover, FG argued that it was not in Onnoghen’s position to determine whether or not the charge against him was proved beyond a reasonable doubt, saying “The defendant cannot place a burden that the Constitution has not placed on the prosecution.” FG’s lawyers’ clash Meanwhile, there was sharp disagreement in FG’s camp immediately the CCT commenced its proceeding, yesterday, as two senior lawyers in the prosecution team, struggled for the microphone to address the panel. Shortly after FG’s lead counsel, Mr Umar, SAN, announced his appearance, a member of his team, Prof. Zainab Duke, attempted to take over the microphone to address the Mr Danladi Umar-led three-man tribunal. With a paper in her hand, Prof. Duke tried to use the microphone but Umar, SAN, quickly grabbed it and shouted on her to sit down. “There cannot be two leading counsel in this matter. Sit down! You cannot speak,” Umar noted. Meantime, Prof. Duke, who struggled to regain her position after she sank to her seat in the middle of a struggle for the microphone with Umar, did not give up, as she kept shouting, “My lord, I need your protection.” Intervening, the CCT Chairman, Mr Umar, urged both parties to calm down, after which he foreclosed Prof. Duke from addressing the tribunal on behalf of the prosecution. “Only one of you can speak for the team. Whatever you have to say to us, I suggest that you inform the lead counsel,” the CCT Chairman stated. CCT fixes Thursday for judgment Meanwhile, the tribunal fixed Thursday to deliver judgment on the charge against Onnoghen. The tribunal said it would also on that day, deliver a ruling on two applications the erstwhile CJN filed to challenge the competence of the criminal proceeding the government initiated against him. The application was accordingly granted by the tribunal which ordered her exit, even as the former CJN watched the drama from his vantage position in the dock. Nevertheless, speaking to newsmen outside the courtroom, Prof Duke said she only wanted to draw the attention of the tribunal to the similarity between Onnoghen’s trial and a case she said took place in England over 300 years ago. Meanwhile, the tribunal fixed Thursday to deliver judgment on the charge against Onnoghen. The tribunal said it would also on that day, deliver a ruling on two applications the erstwhile CJN filed to challenge the competence of the criminal proceeding the government initiated against him. FG had in the charge marked CCT/ABJ/01/19, alleged that Onnoghen’s failure to properly declare his assets, was in violation of section 15(2) of Code of Conduct Bureau and Tribunal Act. However, in opposition to his trial, Justice Onnoghen, queried the validity of the charge against him, stressing that FG violated established judicial precedents by not allowing the National Judicial Council, NJC, to firstly investigate the allegation against him, before it rushed the matter to the CCT. He argued that failure to channel the petition against him, as well as the outcome of the investigation that was purportedly conducted on assets declaration forms he submitted to the Code of Conduct Bureau, CCB, to the NJC, rendered the charge invalid. Justice Onnoghen drew the attention of the tribunal to its judgment that quashed a similar charge against another Justice of the Supreme Court, Sylvester Ngwuta, on the ground that the NJC ought to have been allowed to look into the matter before the case was filed. He stressed that the two judgments were yet to be set aside by the Supreme Court. Aside from challenging powers of the tribunal to try him, Onnoghen, said he was afraid that he would not be accorded fair hearing by the tribunal which he described as an appendage of the Presidency. He insisted that he was entitled to a fair hearing by an independent and impartial tribunal, under section 36(1) of the 1999 Constitution, as amended. The defendant argued that the CCB which recommended his trial, the Attorney General of the Federation who is prosecuting him, and the tribunal itself, are all answerable to the Executive Arm of the government. He equally asked the CCT chairman to disqualify himself from the matter considering that he equally has a criminal allegation pending against him. The tribunal had in a ruling on March 11, relied on section 396(2) of the Administration of Criminal Justice Act, ACJA, 2015, and Paragraph 5(5) of its Practice Direction, held that it would not consider the merit of Onnoghen’s objection to the charge, till conclusion of the trial. While FG closed its case against the ex-CJN after it produced three witnesses to testify before the tribunal, the Defendant who initially proposed to also call three witnesses to defend the charge, announced his decision to close his defence after his driver testified that he was present when the disputed asset declaration forms were submitted at CCB’s head office in Abuja.